Sometimes, being an environmentalist means sitting in a parking lot on a hot day. It was a beautiful Saturday morning on the cusp of fall, and I found myself sitting at a table in a mall parking lot, watching a stream of cars pass by. Why was I there when I could’ve been out at the lake or paddling down one of our famous Manitoba rivers? I was there because I believe in recycling. Perhaps it sounds outdated to talk about the importance of recycling – of COURSE we all recycle, don’t we have blue bins and put them out every week? It’s practically a social faux pas to NOT recycle these days. But have you considered all those tricky items that don’t go in the recycling bin and usually just end up in the dump? 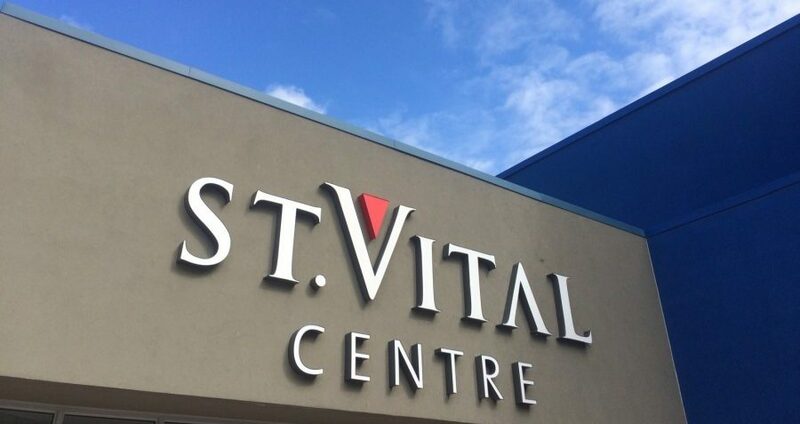 This year, St. Vital Centre organized a one-day event to help collect some of these items that either go to the landfill or clutter your garage. It was dubbed ‘Green With Love,’ and it was a great idea – bring together a number of groups who could give residents the opportunity to dispose of their unwanted goods in environmentally and socially responsible ways. The Canadian Diabetes Association was there with their “Clothesline” program, collecting gently-used clothing and still-working small electronics. Too often we throw things out that still have plenty of life left in them! It’s worth being considerate of what you donate for re-use though – don’t send away the old stretched-out T-shirts unless they’re going to be used as rags or turned into insulation. Want more info on the Clothesline program? Check it out online here! E-waste was being collected for responsible recycling, as well. I was astounded at the rate at which pallets were filled. I think by the end of a 6 hour day, an entire semi trailer was full of old TVs, gaming systems, VCRs, CPUs, and computer screens. Apparently we all have a lot of e-waste that we feel too guilty to throw away but don’t know what to do with! Did you know that your electronics contain valuable metals and minerals that are highly recoverable? Often when you donate old electronics, they will first be tested to see if they can be refurbished, then used for their still-usable parts, and only after that is done will they be dismantled and used for the raw materials. Winnipeg’s 4R depots, as well as Urban Mine, collect and responsibly recycle e-waste year-round. EPRA Manitoba also provides a map of various e-waste drop-off locations around the province. London Drugs surprised me by showing off their “Green Deal” program, which accepts huge quantities of recyclable materials every year. Got old electronic appliances that no longer work and aren’t sure what to do with them? London Drugs will accept them! E-waste? They’ll take that too. Styrofoam is one of those technically-recyclable items that usually has to end up in the landfill – take it to London Drugs instead of tossing it. For the full list of what they accept, got to www.greendeal.ca. 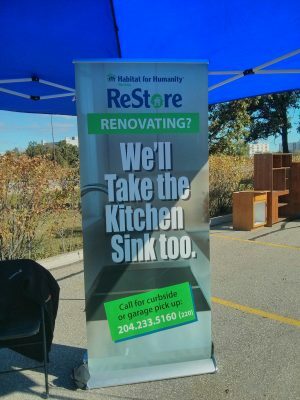 Finally, Habitat for Humanity, the charity which supports affordable home ownership for low-income residents, was there collecting donations for their Re-Store. Their sign proudly announced “We’ll take the kitchen sink, too”. Originally they brought out one truck, not sure what to expect – in short order they had to bring another truck, and another, filling at least three box trucks with household furnishings and fixtures. Each truck was worth about $1,000 to them and represented tonnes of items that would have otherwise gone to waste. The ReStore accepts donations and will do free pickup! Call 204-233-5160 ext 220, or visit www.habitat.mb.ca for pickup or more information. Waste reduction has many components, starting with not buying what you don’t need; repairing things that break; and choosing items with less packaging. But sometimes we have something that really doesn’t fit our needs anymore that somebody else would love – finding the right place to donate it is a good solution so it can be re-used! And sometimes things break or reach the end of their useful life, and then responsible recycling becomes important. I recently did a bit of research on the environmental impacts of cellphones, and it’s given me a lot to think about. 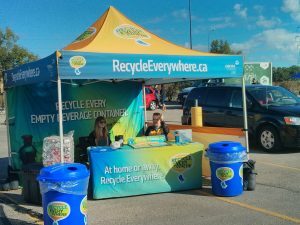 I’m thankful that St.Vital Centre took the initiative to bring all these groups together and provide Winnipeggers with an opportunity to be responsible about their consumption and disposal. Though I still think that shopping needs to be reconsidered in significant ways, I’m happy to know that there are people working within malls like St.Vital who share our desire to live sustainably, and that they’re using their position as a commercial hub to connect a lot of people with messages of environmental stewardship, quickly. What would it be like if our shopping centres were eco-hubs, bringing together transportation, responsible consumption, waste diversion, resource recovery and a wide range of community services? Not sure “what goes where”? Try this handy website maintained by Green Manitoba! You can search for a depot near you, or check their A-Z listing of materials to find out how items can be recycled. UPDATE: We just hear from St. Vital mall that 14,397 pounds of e-waste were collected! That’s the equivalent of eight Smart Cars. Way to go Winnipeggers for disposing of your e-waste the right way. Also watched this the other day – quite something. Agreed, Adam! And one way or another, we have to find interesting new ways of collaborating and making use of existing infrastructure if we want to see widespread environmental changes. In the ‘Delivering Community Power’ document that proposed a new vision for Canada Post, they make the comparison between the number of Tim Hortons in Canada (3468) and the number of post offices (6300), as a way of highlighting the potential of such a vast and integrated retail network. Could shopping malls be re-visioned, as well? As hubs of creative reuse, recycling, or more? Worth dreaming about, at the very least! It’s great to see that there’s good environmental stewardship in places you might not expect to find it! And that there’s a pent-up demand for ewaste recycling, most people will make good choices if it’s reasonably convenient.